Connectors come and go. That is the nature of technology. Each new solution builds on the last to help customers make more reliable, denser, easier to install, lower cost, better performing products–or all of the above. Many optical connectors came down the pike over the past three decades. In maturing markets, LC and MTP*/MPO small form factor optical connectors have edged out competing technologies to rise to the top. Legacy SC connectors now tend to be used for lower-density patch panels and optical modules, with FC connectors specified for more robust test equipment environments. ST, SC, FC, and MU connector use has declined due to obvious benefits of other options. LC and MTP/MPO small form factor optical connectors have emerged clear winners for users, system integrators, and optical component and transceiver designers. That jumble of acronyms warrants clarification. LC interconnects deliver optimal performance and the ease-of-use of a ceramic ferrule-based connector. In singlemode applications, APC (angle-polished connectors) versions provide superior back-reflection performance. LC connectors feature optional six-position rotational ferrule tuning, which allows the lowest possible insertion loss performance. MTP/MPO interconnect interfaces provide ultimate density with tradeoffs for optical performance and concentration of fiber ports. When higher fiber density is required, the solution often demands a jump from ceramic ferrule-based connectors to precision molded MT multi-fiber ferrule-based connectors. The MT precision molded ferrule can support two to 72 optical fibers and is utilized as the fiber-aligning element of an MTP/MPO connector. Two guide pins, part of the pin-and-hole alignment mechanism in an MT ferrule, provide precision alignment of fibers across two mating MT ferrules. To get a visual, imagine the MPO connector, which is an industry-standard multi-fiber rectangular connector interface that houses the MT ferrule in a male side (with guide pin)/female side (sans guide pin) configuration. 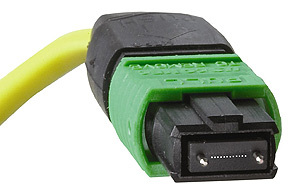 A vendor-specific trademarked version of the MPO connector interface, MTP connectors improve optical and mechanical performance of the interface especially when mating to optical modules due to its unique design allowing for enhanced MT ferrule floating when mated to a fixed optical interface like in a transceiver. MTP/MPO interfaces support multimode and singlemode fiber types in different fiber counts, cable constructions, and cable outer diameters. Optical performance comes from the MT ferrule precision molding process, guide pin alignment and fiber polishing processes. Multimode ferrules are flat-polished, while angle-polished singlemode MT ferrules improve return loss performance. Industry standards drive fiber counts for MTP/MPO connectors when used with specific optical modules such as QSFP (eight functional fibers, four center fibers unused) or CXP (24 fibers). Standards will soon define 16- and 32-fiber versions. MTP/MPO technology offers density improvements over LC connectors at the per-fiber port level. Ask Molex about the winning optical solution right for your application. *MTP is a registered trademark of US CONEC.